It is October, and that means that there is a fifty percent chance that this blog is going to suffer a Blogcation. And the theme of this year's Halloween Kitties is RAEBNC. What is RAEBNC? Glad you asked. RAEBNC is a short way of saying, "Read And Enjoyed, But No Comment." It is something that one would often read in Amateur Press Associations zines. It was used for those times where you read something, enjoyed it, but really could not be bothered to come up with a thoughtful comment. Kinda like the reaction buttons on Facebook. Or the Love button on Facebook (but with less get-up-and-go). And there are days when I so want to use RAEBNC on Facebook. But that would involve actually explaining the term...which would be more effort than I would like to make. Still it could be a fun thing to do, especially if I did not have to explain it. Just drop it in multiple discussions. Just drop RAEBNC in the comment/reply section and move on with your day. What is the worst that can happen? They defriend you? They ban and block you? Sounds like a winning day to me. So this entire month is going to be devoted to cats in costumes (or not) and strange replies you could just drop into comment sections to amuse yourself. Or me. Or both of us. Long live chaos! 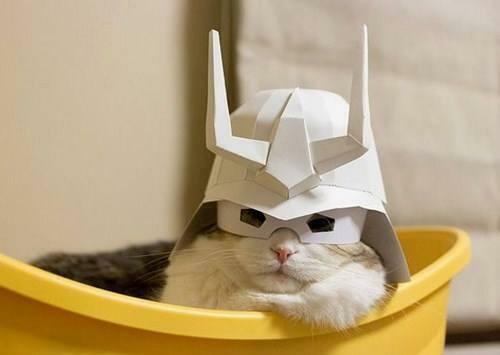 I would comment, but I am too busy cosplaying in this bucket.